The ISOCAL 6 is the only calibration system in the world (Patent application 9900158.8) to offer you six calibration baths in one product. It is a complete temperature calibration laboratory in one simple, easy-to-use package. It is designed to expand with you to fulfill all of your future calibration needs, while giving you the flexibility to meet your current budgetary demands. The ISOCAL 6 can calibrate temperature sensors absolutely, or by comparison. It will calibrate contact and non-contact sensors, including infrared thermometers, surface sensors, mercury-in-glass thermometers, as well as thermocouples, RTDs, and thermistors of any shape. There are three different models of this Isotech Dry Block Calibrator, covering a total temperature range of -45°C to 250°C. The ISOCAL 6 has interchangeable inserts to give you the most flexible calibration system ever, with unprecedented accuracies from ±0.001°C using fixed point cells. Due to its modular design, the Isocal 6 is surprisingly economical. Consider the wide range of temperature sensors you can calibrate with it. 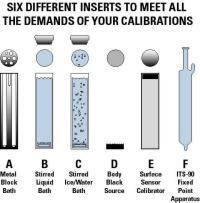 Competitor's product offerings would require you buy 2 or 3 different calibrators!